William Freddy Curtis, student Rebekah Faulkner, Congresswoman Diane Black, CCHS Principal Mike Jones, Asssistant Principal Kay Barker and Director of Schools Barbara Parker. School have a greater selection of books to choose from following a visit to the school from Congressman Diane Black Tuesday (Aug. 20). 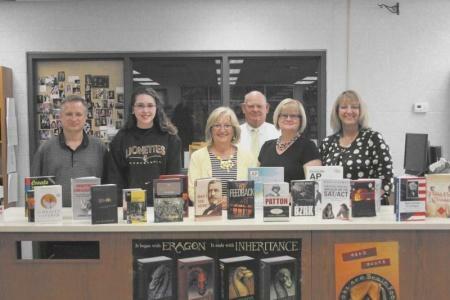 Black visited CCHS for the purpose of donating books from the Library of Congress, which is the largest and one of the greatest of what may be considered national libr-aries. It contains some 18 million books, 2.5 million recordings, 12 million photographs, 4.5 million maps and more than 54 million manuscripts. Black visited with Cannon County Director of Schools Barbara Parker, CCHS Principal Mike Jones, assistant principal Kay Barker, Freddie Curtis, U.S. government teacher, and senior Rebekah Faulkner during her 30-plus minute stop. Congressman Black said she enjoys donating books to schools from the Library of Congress as much as the librarians do receiving them. She takes full advantage of a program that enables members of Congress to select various books for such donations. Cannon County High School received books ranging from how to study for the ACT, history, sports, and music, among others. Black said her love of libraries and reading is a reason she takes advantage of a program that enables schools to receive some of the books from the Library of Congress. Wonder why Black never answers question to the public at the Courier and local radio station ?